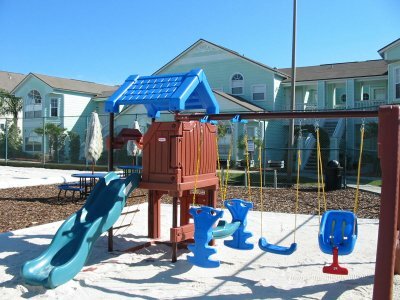 Lovely 3 bed 2 bath Condo only 5 miles from Disney. King size bed in Master suite with south facing balcony overlooking small lake. Queen size bed and twin beds in 2nd and 3rd bedrooms. Unit on top floor and opposite clubhouse, tennis courts and pool area. T.V. and VCR, entertainment centre in lounge. Kitchen/Dining area well equipped with cooker, fridge/freezer, microwave and dishwasher. Large Washer and Dryer, Hair dryers in bathrooms. Parking to front of unit. Two large heated swimming pools and hot tubs with decking, sunbeds, tables and shades. Clubhouse with exercise equipment and games. Two tennis courts. Racquets and balls in unit for guests to use. Close to all restaurants and supermarkets on the US 192. Orange Lake Country Club only 1 mile away for great golf.